China - HISTORY'S HISTORIESYou are history. We are the future. 1. GEOGRAPHY: Geography is the study of how humans interact with their environment. Like other ancient civilizations such as Mesopotamia, Egypt, and India, China developed because great rivers brought water to the early settlers and silt to the land, making farming possible. Because the area around the Yangtze and the Huang He rivers in China was suitable for farming, cities eventually developed along their banks. 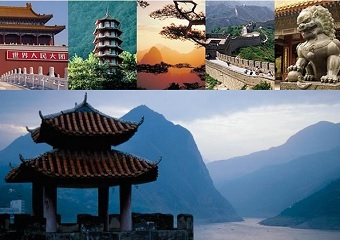 The diverse geography of China has numerous natural barriers that include some of the world's most imposing mountains and deserts. Because of those natural barriers, for thousands of years China remained isolated from much of the ancient world and developed along very distinct lines. In fact, except for the barbarian Mongol tribes to the north, for thousands of years the ancient Chinese thought that they were pretty much alone on the planet. 2. EARLY DYNASTIES: Around 12,000 years ago tribes of nomadic hunter-gatherers began to settle near the Huang He river in the north of China. From these early settlements the relatively sophisticated Yang-shao culture arose. The Yang-shao lived in simple, bare settlements and hunted for game with carved stone spears. Archaeologists have uncovered many Yang-shao villages in northern China. In one village, they found the remains of farmhouses built partly underground, with plaster floors, and roofs held up with wooden posts. The Yang-shoa culture gave way to the Lungshan people. By 3000 BCE the Lungshan had built a society based on agriculture. They mined jade, wove silk cloth, built their homes from baked bricks, and worked together on irrigation projects. 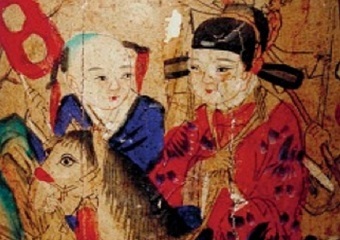 Chinese civilization sprang from the successes of these early cultures thousands of years ago, making China the oldest continuous civilization in history. 3. THREE PHILOSOPHIES: In Chinese history, the 250 years between 475 and 221 BCE is called the Warring States Period. During this time, the region ruled by the Zhou Dynasty was divided between eight states and those states were engaged in almost constant warfare. Because of that, kings of the rival states frequently sought counsel on how to consolidate their power and defeat their rivals. That need for counsel resulted in the birth of three great philosophies during this period: Confucianism, Legalism, and Taoism. While all three philosophies had a common goal - to restore peace, order, and stability to China - each went about achieving that goal in very different ways. 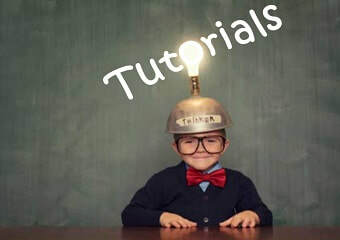 In this lesson you will learn the key beliefs of each philosophy and understand how each philosophy bases its beliefs on a fundamental difference in how they view human nature. Later, you will write a letter to a Chinese king advising him on the best way to end the Warring States Period and unite the competing states. 4. A UNITED CHINA: At the end of the Zhou period and the time of Warring States, a few battles were still being carried on between rival kingdoms. 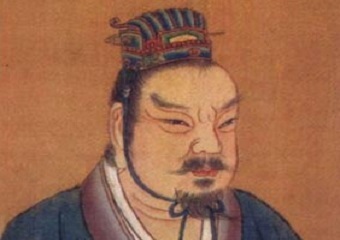 One of the more powerful kings at this time was Ying Zheng, king of the state of Qin. Ying became king at the age of thirteen and for the next 25 years he battled enemies both inside and outside of his kingdom. In 221 BCE, he defeated the last of his rival states. In doing so, Ying, for the first time, created a unified China. 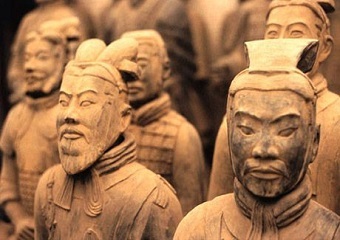 In fact, we get the name "China" from the westernized pronunciation of his home, the state of Qin. When Qin set about ruling all of China he undertook sweeping changes. In order to better manage his empire, Qin put in place a bureaucratic system of government and standardized weights and measures, as well as language. Today, the manner in which he achieved the many changes he put in place seem harsh. Perhaps. Remember, however, that after 250 years of constant warfare, changes were needed. 5 HAN DYNASTY: Following the death of Emperor Qin Shi Huang di, China erupted in Civil War. Reuniting China after that period of unrest was a man of peasant origin, Liu Bang. One of only two peasants to rule China, Liu's rise to power was completed when he became the first emperor of the ﻿Han Dynasty﻿ (206 BCE-220 CE). The Han Dynasty was one of China’s longest lasting and one that saw the most change. 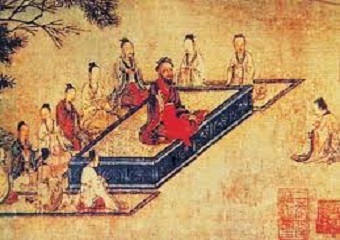 Dispensing with the Legalist rule of Qin, Han emperors valued education and put in place a political system based on the teachings of Confucius. In terms of power and prestige, the Han Dynasty rivaled its almost contemporary Roman Empire in the West. In fact, the period of Han rule was considered a golden age in Chinese history. It was during this time that China first opened it's borders. 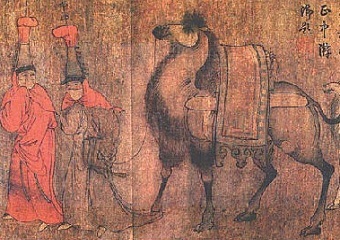 As a result, trade along the Silk Road flourished. Such trade resulted in economic gains, as well as an exchange of new ideas, technologies, and beliefs that changed cultures from East to West. 6. THE SILK ROAD: A period of stability was established across China during Han rule. One result of this stability was an increase in trade between the cities of the dynasty’s region. With the expansion and then the opening of China's borders, this trade spread to regions that are now India, Pakistan, Iraq and Iran, eventually reaching as far as the Mediterranean Sea and Rome. 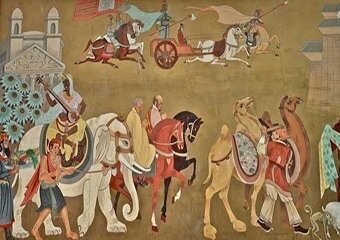 The trade routes established came to be known as the Silk Road. The Silk Road connected the West with the East. Cities around the Mediterranean formed the Silk Road's western end, while The Han Dynasty’s capital Chang’an in central China was the main city at the eastern end of the Silk Road. Rather than providing a direct link between the Mediterranean and China, however, the Silk Road was actually a network of roads that extended in all directions of the compass. Over time, as maritime technologies improved, sea routes were added to carry the increased Silk Road trade.